It rarely happens that total teamwork across city, state and national bodies both in our specialist convention industry and in the wider industry arena, comes together to bring a prestigious international conference home to its city. Especially when this is the largest conference ever to have come to the city and returning for a second time. This makes the teamwork to bring the 18th International Conference & Exhibition on Liquefied Natural Gas (LNG18) conference to Perth all the more impressive. Liquified Natural Gas or LNG is natural gas that has been converted to liquid for ease of storage making it much easier and more cost efficient to transport. With three main global events impacting the energy industry – economic crisis causing demand slowdown, geopolitical crisis in Eastern Europe with threats to secure supplies and the spectacular tumble in oil prices. “All eyes have turned to LNG as it has emerged as a useful back up resource for diversifying and securing energy supplies” states Jérôme Ferrier, President of the International Gas Union (IGU) in his introduction to IGU’s World LNG Report indicating the reason for the substantial growth of the LNG event. The LNG18 conference ran in Perth 11-15 April, 2016 solidifying recognition for Australia’s key position as a global supplier and a key LNG exporting country. Australia, through the Australian Gas Industry Trust (AGIT) and Australian Petroleum Production & Exploration Association (APPEA), was the host country for LNG18. The International Conference & Exhibition on Liquefied Natural Gas, known as the LNG X series, is held once every three years and is widely recognised as the world’s largest and most prestigious LNG conference. It attracts up to 5,000 participants from over 70 countries, including 2,000 high-level delegates, such as energy ministers and senior executives from key LNG companies and organisations. The 5-day program is supported by an exhibit with 112 custom build stands and a further 11,500m2 of exhibition stand space where over 200 exhibitors from more than 60 countries are showcased. The bid itself began in 2009 at the World Gas Conference of the IGU after a series of discussions with the prospective hosts and a decision that it was the right time in the development of the industry in Australia to bring the event back. The first pitch was mounted in Buenos Aires with the inviting bodies supported by the Perth Convention Bureau (PCB) and promotional events included a reception at the residence of the Australian Ambassador. A Steering Committee was formed and the PCO Arinex was appointed to mount the Australian bid pitch as they had been involved in the LNG12 in Perth in 1998. Very much the underdog as #4 or 5 LNG producing destination against a serious global energy player and the #1 LNG producing country in Qatar, Australia’s concerted efforts across all stakeholders in the city as well as the Australian industry paid off with Perth selected to host LNG18 in April 2016. Australia’s strong reputation as a world-class LNG producer and its proximity to key the LNG demand centre in the Asia-Pacific led to an early identification of the Asian region and Russia as a key area for promotion. Business Events Australia stepped in with further funding and promotional support. Managed by Arinex, a significant series of functions presentations, e-communication, social network marketing and booth promotion was mounted plus more than 20 State Government and Media promotions. 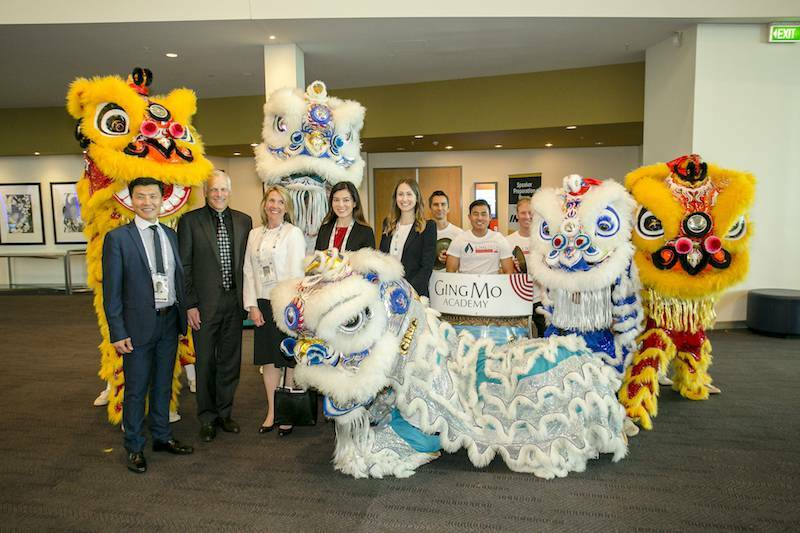 Kicking off at the LNG17 in Houston in April 2013 and in addition to the World Gas Conference in France in 2015, major presence was mounted at several ‘energy’ events in the Asia Pacific region. As the date arrived the growth of the delegate registrations rose and the exhibition sold out the available space. Arinex and the exhibition organiser Exhibitions & Trade Fairs (ETF), worked closely with the Perth Convention & Exhibition Centre (PCEC) and Perth Expo Hire as well as with the Perth Convention Bureau (PCB) and the State Government to ensure the location stepped up to the mark to accommodate the record numbers. The hotel properties joined together with the AHA to provide rates over 29 properties and the City of Perth (COP) enabled the destination to provide an exciting support program to ensure attendees could make it a “Trip of a Lifetime” so often expected when attending international conferences in Australia. With the demographics showing 68 countries represented with 21% of the participants from Asia many Australian “classics” were brought to bear in the design of a busy schedule of day trip options including Museums and Art Galleries, a Swan Valley Winery tour and a chance to meet the famous “Aussie Wildlife” in the Caversham Wildlife Park for the Accompanying people whilst Pre and Post Conference Tours offered options further afield including WA’s Margaret River wine country, an outback experience in the Wilderness Park of the Kimberley region in the northern part of the State of WA, the “Red Centre”, the Barrier Reef and Australia’s largest national park - Kakadu. There were also a range of technical tours set up to showcase the industry developments of the location. The promotion into the Asian region ensures the growth of the event into the next series when the event goes from an exporting country to an importing destination on its cycle.One of the major delegations from Asia attending LNG18 was the promotional team from China – the hosts of LNG19 being the next presentation of the LNGX series which will be held in Shanghai 1-5 April 2019. China was selected from among a number of strong candidates. Coordinated by Dr Lin Wensheng LNG10 Deputy Secretary General of the China LNG Association, the collaborative efforts of the Chinese associations included various groups. LNG19 will be supported by the Shanghai Government and hosted by the China LNG Association, China Gas Society, The Chinese Association of Refrigeration and the China Gas Association.